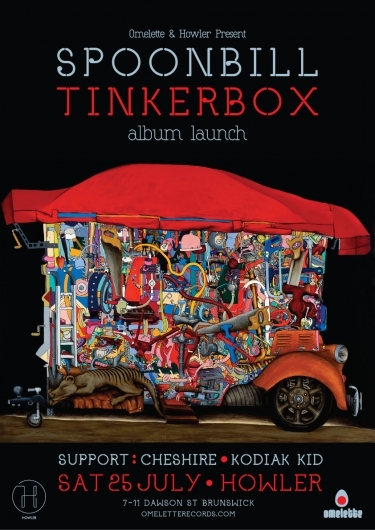 Omelette Records join forces with Howler to bring you the special launch event for Spoonbill’s new album; Tinkerbox. This is Spoonbill’s 4th full-length album and for many it may well be his most impressive release to date. The album sees a shift from the recent dancefloor heft to a more lush and cinematic listening focus. The album features an array of exceptional musical talents recorded in studios around the world over the last 5 years. The live instrumentation has been forensically sculpted with synthesized tones and foley recordings to achieve a dynamic spectrum of tonality that provides the listener with an evocative cerebral experience. This special live show will feature a choice selection of guest musicians from the album and will be performed alongside a custom projection mapped set that will be set alight by VJ Dropbear. Cheshire will be supporting on the night and showcasing a selection of fresh downtempo groove that’s scheduled for released on Omelette later this year. Also providing support is local DJ chief: Kodiak Kid who will warm up the night with a tasty selecta of quality tunes. This one-off show promises to be an audio-visual spectacle to remember.